Music discovery is desperately in need of simplification. In the quest to stay on the pulse of the best new music, we’ve created a formidable cycle of information overload that even the most dedicated of fans can’t keep up with. Enter Cymbal, an elegant new music discovery app designed with simplicity at its core and powered by the most ancient and trusted source of information: friends. Founded by Gabe Jacobs, Amadou Crookes, and Mario Gomez-Hall while undergraduates at Tufts University, the app aims to bring music discovery back to its roots. Based on the idea that music suggestions from friends carry more weight than do recommendations from service-driven algorithms, Cymbal lets its users do the heavy lifting. In the app, each user chooses just one song to display to followers at a time, creating a constantly updating playlist of his or her favorite music. “It cuts out the overload from Spotify—if you go to my profile [on Spotify], there’s tons of music I don’t really listen to, but on Cymbal it’s a true representation of me,” Crookes said. The concept for Cymbal originated in a familiar place for music lovers: a blog. With Cymbal, you’re not just getting a good new song or a sampling of songs that somebody sort of likes; you’re getting a song that your friend—or someone you follow—really likes. In other words, it’s quality over quantity. “If you’re posting top 40, no one cares because everyone already knows about it. So in a sense you’re kind of showing off that you have this great song. The design [of the app] incentivizes high quality content,” Gomez-Hall, the lead designer, explained. 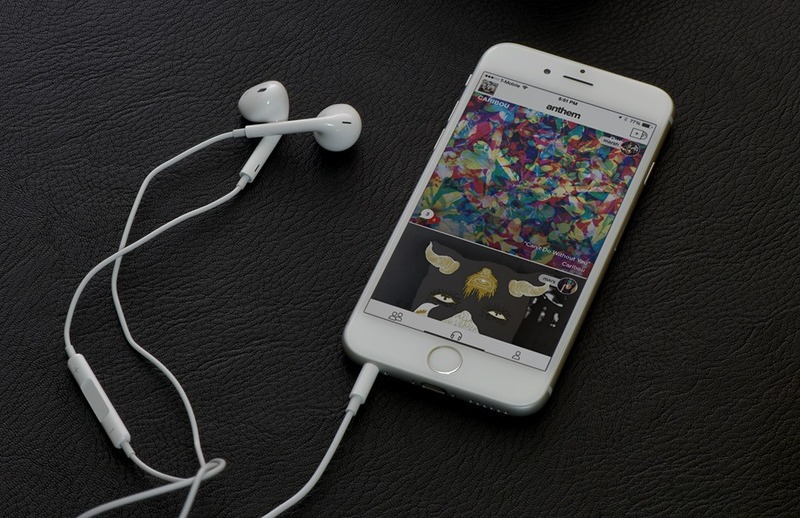 The app’s interface is bold and clean, with the home screen consisting of beautiful, high-resolution album art of each user’s selected cymbal. A small profile photo of the user sits in the top right corner of the album art, giving each selection a personal touch. A user’s chosen cymbal is meant as a reflection of their musical taste or a given moment in their life, much like a Facebook profile picture. “We’re trying to represent [profile pictures] with music—that a song can represent you or a snapshot of your life really well,” Jacobs said. And this is where Cymbal draws its poetic power, becoming a running soundtrack to a user’s life. You could set a slow-burning indie jam on the way to work as the sun rises over the Boston skyline, a guitar-riff laden jump-up cut while hitting the gym, or even some crackling vinyl jazz as you stare out the window at an impending rainstorm. There is no limit to the number of times users can change their anthem, but the team has noticed that people tend to only do it once or twice a day—similar to the way people use Instagram. Having met in Boston, the founders feel that the city’s diverse, accepting music scene and robust startup culture encouraged them to pursue Cymbal. The app is currently in a rapidly expanding beta and is set for a full release in the next few months. Since I spoke with the team, they’ve already added a swathe of features—including integration with services like SoundCloud—and are planning enhancements to the commenting system to allow for user tagging and hashtags. Cymbal and its creators have hit on something special here. In a world where the sky is the limit, they’ve boiled it down to the essential building blocks—getting to the heart of music discovery through good songs and good friends. Visit the Cymbal website to sign-up for the beta version and learn more about the app. You can also follow them on Facebook and Twitter. Update: We followed up with the founders of Cymbal– you can read more here.